Vern Eide GM | Mitchell, SD | New & Used GM Cars & Trucks! Vern Eide Chevrolet Buick GMC of Mitchell is a proud member of the Heartland Chevy Team, serving Mitchell, Huron, Madison, Brookings, and all other Central South Dakota communities. Vern Eide Chevrolet Buick GMC and our sister store Vern Eide Ford Buick will help you find a quality, new or used vehicle in Mitchell, SD. Home of the Eide Effect, each and every Vern Eide Motorcars family member believes in treating our customers, employees, and community as we ourselves would want to be treated. Whether you're buying a new car or taking care of some auto repairs, Vern Eide Chevrolet Buick GMC is committed to providing you with a friendly, stress-free experience. 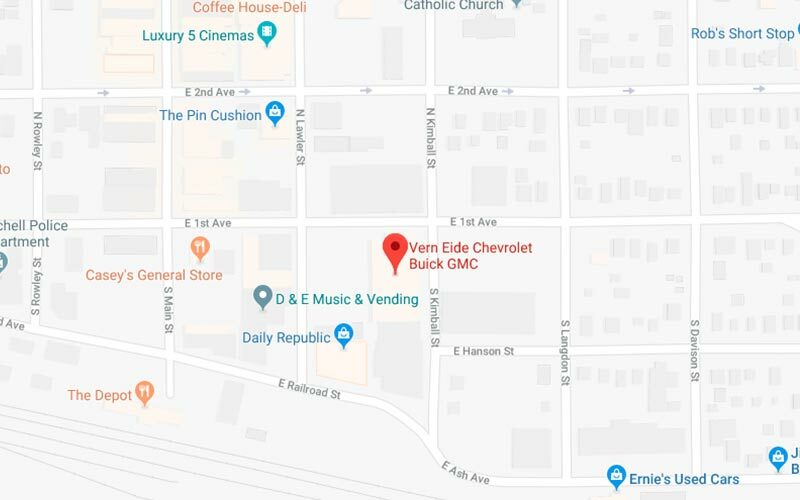 Located just minutes from the world famous Mitchell Corn Palace and the outdoor sports giant, Cabela's, stop into Vern Eide Chevrolet Buick GMC today and witness the Eide Effect for yourself. Whether you are in the market to purchase a new or pre-owned vehicle, if you need financing options, we'll help you find a car loan that works for you! Even if you have bad credit, or are a first time car buyer, you can trust that your local Heartland Chevy Dealer will professionally fit you into the automobile of your choice.Vern Eide Chevrolet Buick GMC has a professionally managed Service and Parts Departments open extended hours to accommodate our customers' busy schedules. And, as always, Vern Eide Chevrolet Buick GMC offers competitive pricing for your automotive maintenance needs. Please feel free to contact us at (888) 611-5051 if you have any questions or comments. We had a great experience with Vern Eide. The trade in that we did was super easy, Jennifer was an excellent team member that showed us all the options and put us under no pressure to purchase. The whole experience was awesome, even a week after the purchase they are checking in to make sure we are happy. Highly recommend. My experience with the service department, sales department and credit department could not have been better. Sean in the service department and Dom, my salesman, was fantastic. I was very pleased. The Verne Eide dealership in Sioux City is a top notch business. Their customer service is suburb and they treat their customers in a very professional manner. They make you feel welcome and go out of their way to please you and meet your needs. The service department is exceptional and efficient. This is my third Honda and I have been very pleased with this dealership. I will continue to support this business. Alex did a great job listening to our needs and wants for our car. Took the time and no rush or pressure. One of the more pleasant experiences in car buying. Alex did a fantastic job in listening to our needs and asking appropriate questions to help us discern what the best choice in a vechicle for us. I appreciate how he spoke equallly to my husband and I, sensitive to making sure we understood all the features of the car. All of this made our experience in purchasing a car a pleasure. Ron provided us the opportunity to compare vehicles and the time to make a confident decision! I feel good that my daughter, who is many miles away from me, will be taken care of at Vern Eide Sioux City!! My family and I had the best experience with Verne Eide and Jennifer Bethke. Jennifer's service was tremendous with all that she did for my family and I on getting us a new vehicle. Everyone was friendly and any questions we had were answered right away. I highly recommend anyone who is looking for a new vehicle to go in to Verne Eide, they will definetly take care of you. What kind of car do you drive? I drive a blue 2014 Outlander Sport. Why did you choose Vern Eide Mitsubishi? I chose Vern Eide Mitsubishi because they were helpful right away when I walked in and got me the right car and price that worked with my budget. What do you like most about your Outlander Sport? This might sound strange, but I love the efficiency of the heating and cooling system. It's crazy how fast my car warms up in the winter and how fast it cools off in the summer! I also like the size (not too big, not too small.) I really like the Bluetooth technology. And I appreciate the four-wheel drive; especially for these winters. Oh, and for an SUV, it has a remarkably smooth ride. How was your buying experience at Vern Eide? My buying experience was easy, fast, and affordable. How has the service from Vern Eide been in the months since you purchased your vehicle? The service has been great! They call and check up and see how things are going. They have sent cards for holidays or to thank me for my service. I also like that I can go to them for oil changes. What has been your favorite road trip with your Outlander Sport? My favorite road trip was when my best friend and I went to the Black Hills for the first time! My Outlander Sport made it easy to get around and made the experience more enjoyable, knowing I had a dependable vehicle that I could rely on! What kind of car do you drive? A white 2015 Outlander Sport. Why did you choose Vern Eide Mitsubishi? Mitsu offers a stylish look, great MPG, and all the features I wanted for a price that fit my budget. I can't backup to save my life so it had to have a back-up camera. What do you like most about your Outlander Sport? I wanted a panoramic sunroof for ages but most panoramics are only in luxury vehicles, so I thought this was completely out of my budget -- until I found the Outlander Sport. How was your buying experience at Vern Eide? Awesome. I had Ike as my salesman and he was great. He is always easy to reach with any questions. How has the service from Vern Eide been in the months since you purchased your vehicle? Great. I got my first oil change for free. And when I got a new cell phone a few months after purchasing my Mitsu, Ike helped me sync the phone to the car. What has been your favorite road trip with your Outlander Sport? As the official fun aunt, I now have my family's go-to road trip car. The panoramic sunroof entertains my niece, so any road trip is a breeze. With the Bluetooth, we can bump awesome tunes through the Rockford audio system. Nothing sounds better than "If You're Happy and You Know It" through a premium sound system. I just began my second vehicle lease through Vern Eide. Ike Bean and Travis Hoyt are fantastic to work with! In my experience with the company, I have found them to be honest and informational. They make sure you know exactly what you're getting and are always available for questions. Very responsive to calls/emails, and an overall high-integrity company. I appreciate their help with making decisions on vehicle leasing/purchasing and will continue to recommend them to friends and family. Ike was very awesome to work with and I love my 2017 outlander sport! These guys did everything they could to get me into a reliable car!! Vern Eide Mitsubishi is definitely superior when it comes to customer service and ensuring you are taken care of and happy even after the sale!! This is so refreshing since quality customer service is a dying breed anymore. So far I’ve gotten 2 vehicles there and I’m definitely loyal to this Company as they have earned it in so many ways! If you want a great deal, cared about as a person not just a sale, and treated with respect - go see Ronnie Stovall at Vern Eide Mitsubishi!! You will be amazed at how well you are treated!! I’d give them more stars if I could! The best people to work with!! They help you find the right vehicle. Will definitely go back. This was my first time there. Came in for a recall. The place was spotless, very professional and friendly. Snacks and beverages in the clean and comfortable waiting area, they also offered to shuttle me to the mall if I wanted. They even washed and vacuumed my car, also didn't try to pressure me into more services, but did tell me what should be looked at soon. A very good experience.